Leapfrog has had its ups and downs since the company was founded in 1995.They basically hit a high point in 2004 and then began to decline consistently, until they hit rock bottom in 2009. Their decline was not a function of adverse economic circumstances but rather of internal challenges such as management upheavals, product development issues, supply chain management and so forth. It would now appear that the company has turned around and is well on its way upward again. Secondly, it does not appear that the market stagnation is due to economic factors. 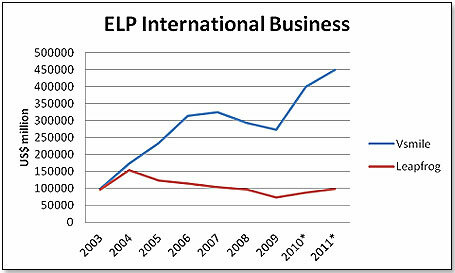 The slide in the ELP market began in 2005 and continued in the years that followed – a period of relative economic prosperity. There is one explanation and it is not a quantifiable one. 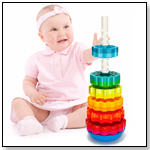 It is that the ELP products do not in fact provide the benefits the parents are seeking – a measurable improvement in the scholastic performance of the child later on, as compared to its non-ELP peer group. There is some anecdotal evidence that mothers, having bought ELP products for their first-born, no longer do so for the second child. Part of it is probably the fact that families have kept ELP products from the first go-around and use it for their second child. 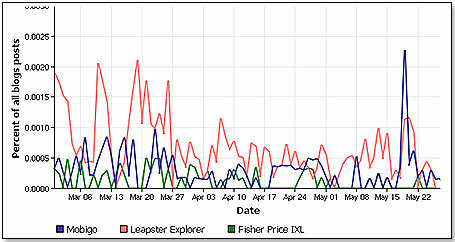 However, a little more likely is the explanation that the first child is already in some type of school setting [since the average intervals between the first-born and the second child in the United States is approximately 3.5 years] when the second child is getting ready for the ELP decision, and that the parent can then elect on the basis of the comparative scholastic performance of the first child whether or not to invest in electronic learning products for the second child. The parent will obviously only make this investment if the performance of the first child in fact warrants this. 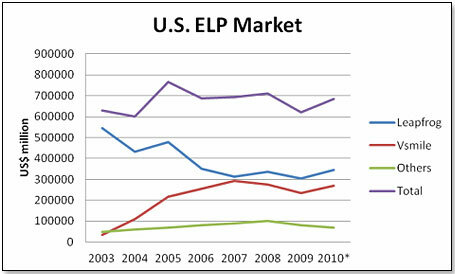 Interestingly, the U.S. ELP market took off in 2001 and doubled in the three years until 2004 at which point it began to stagnate. If one assumes that the U.S. market is hence likely to continue to drift, comparative competitive performance becomes paramount. 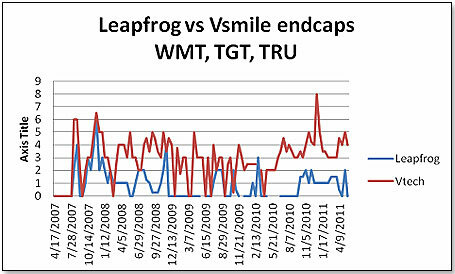 In terms of new products, both LeapFrog and VSmile track approximately on the same level. Both came out with significant new products in 2010. LeapFrog launched the very successful Leapster Explorer whereas VSmile came out with two new products – Mobigo Touch-screen for math, language and logic and the V-Reader, the world’s first animated e-reader. As for 2011, LeapFrog plans to release the LeapPad Explorer whereas VSmile will launch the VSmile Baby - Infant Development System. Both are elaborations on an existing theme and do not break new ground in terms of scholastic criteria. In this analysis, I have not so far touched upon what I would consider the most important differentiating competitive factor – quality and consistency of management. In this respect, at least until now, it has been no contest. 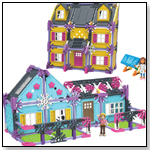 VTech, the parent of VSmile, has been under the top management of Alan Wong, the founder, since 1976. 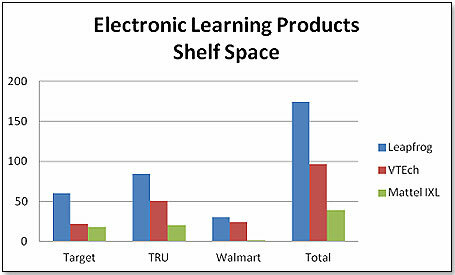 The Electronic Learning Products Operation has been under the worldwide supervision of Mr. Albert Lee Wai Kuen since 1984 and the U.S. ELP operation under the supervision of Mr. Jack Kenneth Hirsch since 1982. All of them are very publicity-shy, reputed to be extremely competent, and obviously very secure in their jobs. LeapFrog had a much more choppy history. Founded by Mike Wood in 1995, the company had not quite ten years of uninterrupted top management when Tom Kalinske, backed by Mike Milken [a major shareholder in the company], demoted Mike Wood to Chief Vision and Creative Officer and appointed himself CEO in Mike Woods’ place on February 10, 2004. . Not so surprisingly, Mike Wood resigned his exalted position as Chief Visionary about six months later. This, incidentally, is also the time when LeapFrog’s slide began in earnest. In May, 2006, life caught up with Mr. Tom Kalinske in the form of Mr. Jeffrey Katz who was also brought in by shareholders, and who then demoted Tom and installed himself as CEO. Prior to this, Mr. Katz had been the CEO of Orbitz, an online travel site, and before that the CEO of Swissair, in whose untimely demise he was intimately involved. Jeffrey Katz’ time came early 2010 when he in turn was replaced as CEO and COO by the shareholders who appointed a duo of senior managers as caretakers until a new CEO could be found. To come back to the question asked at the outset of this article – has the company indeed turned around, and is it well on its way upward again? My take on this would be that whichever of the players in this field manages to come up with products that fully meet the expectations of the mothers will win out. In the absence of such a development, LeapFrog appears well poised to do well in the next twelve to twenty-four months, with a particular upside in their international business.